Dr Triveni Venkatraman is our specialist orthodontist who has been helping patients achieve the perfect smile for nearly 20 years. Triveni graduated from Tamil Nadu Government Dental College, India in 1992 before completing her Master’s Degree in Orthodontics in 1997. Following graduation, Triveni worked in several well-regarded practices in India, treating complex cases in local hospitals while also teaching orthodontics before moving to the UK in 2006. 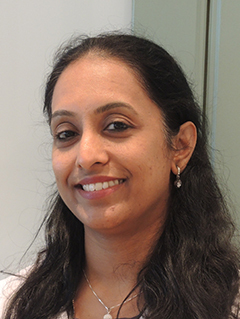 Triveni joined Ravenscourt Dental Practice in 2014 and quickly established herself as a popular addition to our team due to her caring approach and cutting edge orthodontic techniques. Triveni also works as speciality doctor in BUPA practice, Slough. Triveni enjoys all aspects of orthodontics and is passionate about her work, especially when it involves dentistry for children. Catering for both adults and children, Triveni offers expertise in a variety of orthodontic treatments including fixed braces, Incognito, Invisalign and other aligner systems. Triveni is a diplomate of the Indian Board of Orthodontics and was recently awarded a fellowship from the Tamil Nadu Government Dental College. She is also a member of the British Orthodontic Society and a registered orthodontics specialist with the General Dental Council. Away from dentistry, Triveni is married with two teenage children and has a keen interest in yoga. In her spare time she likes socialising with friends and enjoys listening to Indian classical music.